Professor Iveta Radičová is an academic and ex-politician, currently working as a Richard von Weizsäcker research fellow at Berlin’s Robert Bosch Academy. 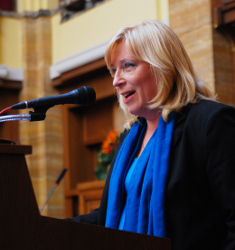 In 2005-2006, she served as Slovakia’s minister for Work, Social Affairs and Families. From 2006–2009, she was a deputy of the Slovak National Parliament and from 2010–2012, she was the prime minister of Slovakia, also temporarily overseeing the work of the Defence Ministry in 2012. Her academic career began in Bratislava, where she received her master’s degree in sociology at the Comenius University and then her PhD. from the Slovak Academy of Sciences. From 1979 – 1989, she also co-ordinated the family policy research team at the Slovak Academy of Scienes, before, in 1992, she founded the non-profit Social Policy Analysis Centre, which she headed until being appointed director of the Slovak Academy of Science’s Institute of Sociology in 2005. Prof. Radičová has published and edited numerous books and studies mapping the transformation of the social-system in Slovakia and other post-socialist countries. She has taught as a visiting professor at universities in Austria, Belgium, the Czech Republic, Finland, Sweden, the UK and the USA. As an expert in social affairs, she has advised various government bodies on social and family policies, participated in the approximation of European legislation in the area of employment and social affairs and also carried out research on poverty for the World Bank. She continues to act as an expert in European projects, focussing on the coordination of social security systems and exchanging information about member states’ social policies (MISSOC, TRESS).